AVP-Dominion is the next step in our continuing line of audio visual control products. Given the console’s ability to maintain a live connection to multiple frames at the same time, we decided to add Macro capabilities. Operators can now create custom macro scripts enabling one button activation of multiple command and/or presets. Precise time delays can be inserted in between commands, aiding in execution timings. The console is completely self-contained and does not require an additional PC, in fact the consoles operating system features an INTEL® Bay Trail-M N2930 processor running Windows 10. Additionally the system is equipped with it’s own Bluetooth receiver, enabling the use of external keyboards, mice or track-pads. Future upgrades and/or patches can be automatically installed by way of the built-in WIFI capability. Simply allow the console to connect to area hot-spots and the firmware will perform it’s own search, notifying you of any availability. Interactive Push Buttons: There are total of 27 interactive push buttons, enabling direct activation of all presets and/or command keys. Each button contain its own LCD screen which provide visual display of the original key labeling, plus register the number and command type. From left to right across the bottom, there are two buttons dedicated for conveniently cycling the preset buttons through an array of pages that may be necessary if an event contains more than 20 commands. It will also align itself with any page assignments already created within the Spyder programming. Displays on these buttons will let users know which page they are currently on. To the right of those is a dedicated button that allows the user to quickly replace the preset buttons with Dominion’s exclusive macro buttons. Rounding out the bottom row are two option buttons, that can assume different purposes based on which switcher an operator is currently connected to. The Spyder version consist of one button to replace the display of presets with function keys, while the other button enables AV-Presets exclusive toggling feature. Color Touchscreen Display: The console comes equipped with its own 10-inch color touchscreen display. 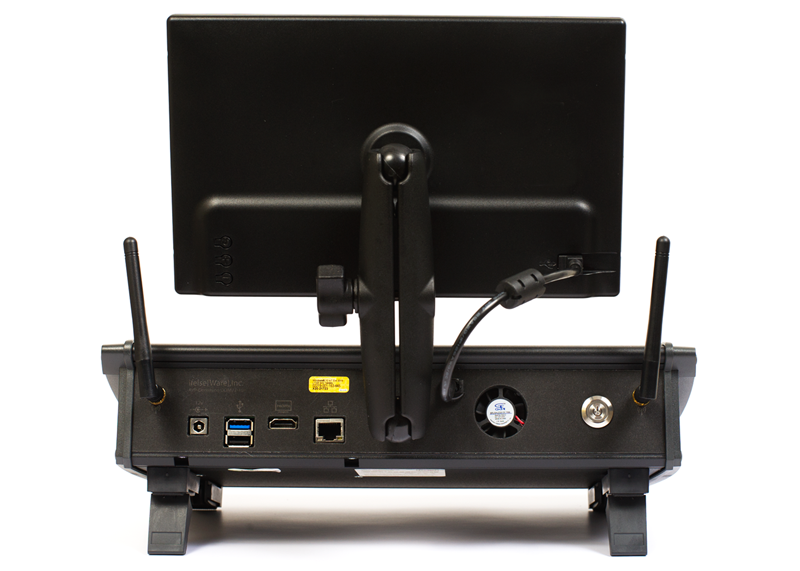 This monitor is mounted externally, providing the user with the ability to adjust it to their desired viewing angle. Via this touch display operators can monitor current preview and program destinations and layers, set-up and activate current frame connections, quickly toggle between switching frames, clear or freeze all layers, toggle backgrounds, design and call up the macro display, and access all console admin settings. Dominion’s concept and design is such that it serves as a perfect platform for future expansion. We at ifelseWare, Inc. are dedicated in providing the audio visual industry with the best operational control solutions possible. As an example, we already have plans on the drawing board to include control of popular video playback devices and media servers. Combine that with ifelseWare’s superior customer support (patches for reported issues are published on average within 24 to 48 hours) you can feel rest assured that investing now in AVP-Dominion will continue paying back dividends long into the future. 27 – 64×32 Wide view LCD push buttons. 1 – 10” 1024×600 touch screen monitor. Processor: Intel Celeron N2930 SoC, 1.83GHz – 2.16GHz burst, Quad-Core Processor. 2 – RP-SMA receptacles for external WIFI antennas. 1 – Custom Pelican travel case. Important Update for X80 Users! Now available is an update for AV-Presets (v2.3.6.1). 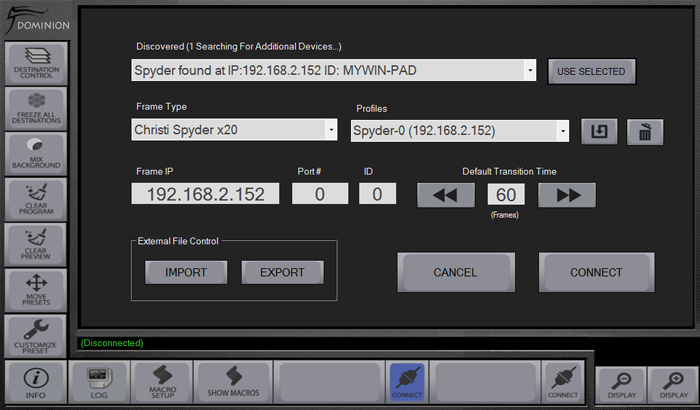 This update makes it now compatible with the new 5.2.2 version update for Spyder X80 frames. At the same time AV-Presets can now smoothly handle linked X80 frames and provide support for up to 48 combined layers. **Important Note** This version will no longer work with any X80 frames that have not been updated to version 5.2 or above. It however, will still work perfectly fine with all X20 switchers. For users that have updated AV-Presets within the last couple of months should now find a "Check for Updates" link under the AV-Presets Windows 'Start' menu group. If your current copy is much older then you will need to uninstall your copy and then re-download the new installer from our website.https://www.ifelseware.com. I know it has been a while since I last updated AV-Presets, but alas a new one is now available. I just got done doing an event using a E2/S3 version 6.2. I must admit I am very pleased at how well this new EM version is working. It appears that they finally got the layer drawing data to update almost instantaneously like it used to be in earlier versions (before v3.6.) 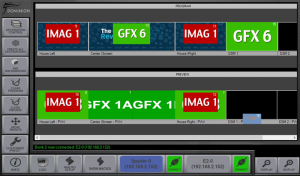 As a very nice consequence, AV-Presets is now back to being more responsive and agile while controlling Barco switchers. However, while using it I did notice a slight side effect of the new revisions and this update provides patches for them. I have also gone ahead and added the ability for Barco E2/S3 users to select which preset appear in each button. After the first time you connect to the fame and the button array is automatically populated you can simply right click on an occupied preset button and then in the popup dialog box you can select from the list of all found presets the one you prefer in that button position. Just repeat the process for each preset button you wish to move. This update also corrects an issue that when controlling Spyder, was causing the updating of preview and program layer pip icons to be redrawn so slowly. As always have a great show! I know I just told you that I made improvements to how AVP handles E2/S3’s but after also working on updates for Dominion, I was still finding myself frustrated with the way both were not reporting accurately just which preset was in preview and which is in program. The reason it is not cut and dry is because the Barco protocol does not any definitive data as to which is in program. The only thing they report is which was the last preset to be recalled to preview. What makes even more vague is if you choose to recall straight to program using EM, it will report that something was put in program but with no preset ID. So because of this AVP has had to do some guessing and up till now, things could appear out of sync if you use an EC console or just do it direct from EM. Well I think this time I found some other techniques to make reporting much accurate no matter which interface you choose to trigger a preset. BY THE WAY IF YOU SEE AFTER DOING AN UPDATE, THE INSTALLER SAYING THERE WAS AN ERROR. IN MOST CASES YOU CAN SIMPLY IGNORE IT. Since I was already working on AV-Presets code I decided to find other parts that might need attention and I found something you Barco users are really going to like! Improved the ability to disconnect from one type of switcher and reconnect to another without needing to restart the entire application. It has been quite a while since there has been an update, but this one is cool. 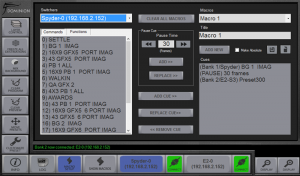 It brings us up to date with the newest version of Spyder X80 (5.0.3 +) and it adds the fact that the back color of occupied preset buttons will be the same as the colors you set a command key to be in Studio/Advanced. Aside from all of that I did also fix the issues recently found in using AV-Presets with Ascender. Made the necessary changes to ensure proper operation with Spyder X80 version 5.0.3 and greater. Added the ability to retrieve the background colors of each command key and use the same color to paint the background of each occupied AVP preset button. I have just published version 2.3.0. 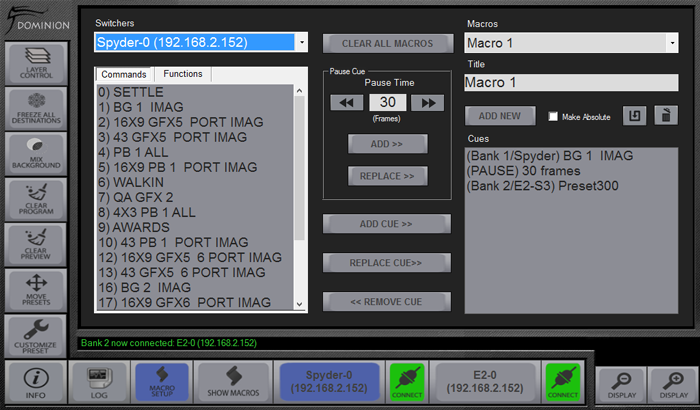 This version of AV-Presets will now communicate with version 5.0 and 5.1 on the new Spyder X80. Don’t worry AVP will continue to work with X20’s as well. I apologize for the delay in getting this update out. I assume you can understand that the X80 as been going through a lot evolving over the last couple of months and we have been kind of waiting until it the system matured enough before talking on the challenge of rewriting AV-Presets to work with it. With that said, please keep in mind that the frame and AV-Presets support of it, are both a work in progress. I am sure there will be additional revisions of AV-Presets being released over the next couple of months as the X80 continues to evolve. 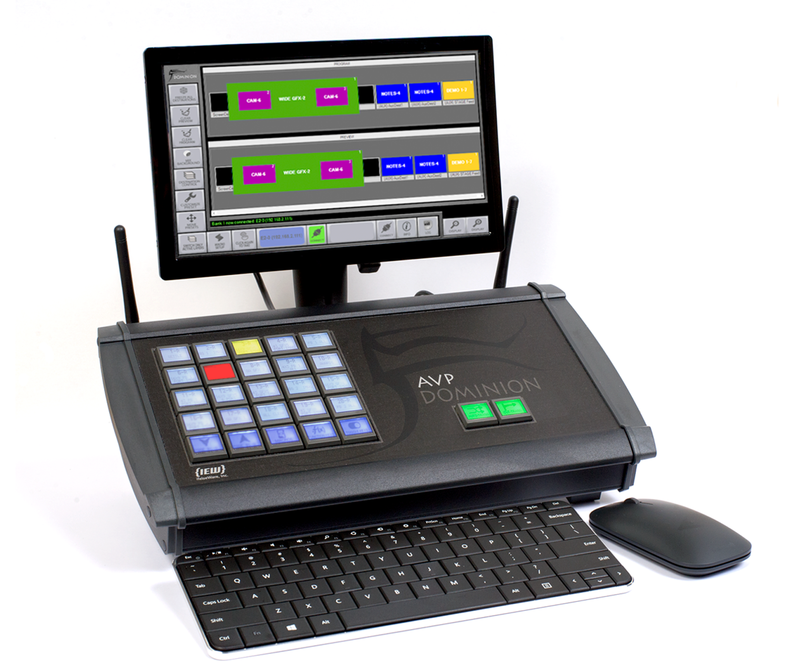 Operations within AVP are virtually identical to that of control of the X20. However instead of 16 layers there are now 24. I am also needing to do more work on AVP’s ability to automatically import thumb and still images from the X80 to populate the layer drawing. In the meantime, you can simply copy all images in the “C:\SpyderData\Vi\Images” and paste them into “C:\ifelseWare, Inc.\AV-Presets\Images\” folder. That will allow AV-Presets to display all the thumbs like it does for the X20. That brings me to the other big change. I have created a totally different installation program for AV-Presets. Now it is a normal EXE installer. Installations are easier but in order for you to get the update you will now need to resubmit your request for a downloaded copy from our website. the "Check for Updates” function In ALL older versions will no longer work. However, once you install this new update that function will resume working again for any future releases. 6720x1920, 12 Projectors (8 Portrait / 4 Landscape), 2 Spyders, 6 Channel Watchout all done pixel to pixel without any blends! Oh, and 9 DSM's and a flown prompter screen all being handled very simply with one Dominion console. AV-Playback has a cool new feature! Default(PIP): This petty much is the way the display looks to you now. There is a new twist though, Now you can click on the PIP window and drag it anywhere within confidence window. You can also resize it, by clicking near the edge of pip panel and dragging. Split Horizontal: select this and the entire window will reshape itself and place both preview next to one another, left to right. Split Vertical: Select this and the entire window will reshape itself, this time program will be on top and the preview panel bellow it. To select just right click on the window and select from the popup menu. The current setting does get saved to the playlist file, so the next you open it, the confidence window will reconfigure to that setting. Anyone who is currently trying AV-Playback for themselves, please use the built in updater to download this critical revision. Regrettably there were some issues that fell trough the cracks and they are really starting to pop up. especially when attempting to operate the app very aggressively, (you know the type of behavior, push any button and see if it breaks.) Well I am scrambling to combat it with a much more stable version. Give it try, and do your worst, I can take it! You can try it out free for as long as you need. The download version is the actual program and is fully functional, however without a USB key the copy will behave as an unlicensed version, so an image mask will be visible during the playing of any media clips. This mask displays our product name as well as the following text - “Unlicensed Copy”. There is also brief audio tone that will also be heard every 8 seconds.  Support of 230 different media file types. 231 when you include the newly supported “.HAP” file type.  Can handle resolutions as high as your GPU can output even when you stich outputs together.  Operate multiple playlist each with their own video output destinations simultaneously.  Cross fade between clips. Can even adjust the fade duration independent of one another.  Loop any clip or an entire set of linked clips. another computer’s GPU, increasing the number of total simultaneously running destinations. Connection is via a simple network cable. This is convenient when you need control playback on remote monitors even ones situated at a great distance, such as out front in a lobby or another room. From the master workstation, operators have full transport control as well as a confidence monitor feeding back full motion video.  Capable of synchronized control of AV-Playback running on a separate backup workstation complete with a user adjustable delayed start.  Automatic transfer of clip files between the master workstation and any remote or backup nodes. No need to keep moving a USB drive from machine to machine.  Ability to include music files in along with the video clips and output user selected background images independently with each song.  Create dedicated music only playlists (No video out necessary). These music playlists can run side by side with separate video playlist.  Robust playlist editing tools.  Convenient launch control window. file from anywhere and fully launch the program. Best of all it is a Windows based software and not susceptible to same games Apple is playing with their OS. Turning their nose up at the Pro market and dropping support for important internal functions, (without warning I might add), that professional playback software would need to operate properly. I am about to start work on including short cut keys into AV-Playback. I would like to know how you would like to see it structured (e.g. Use control key combinations or not, what key makes the most since for what functions, etc.)? If you could take a little time and provide me with a basic outline on how you see it, would be a great help. Question on Group function for Spyder in AVP. I am using a Keys controller. Can i just program a button for a Group Toggle, then select the CK's I want? Or do I have to use multiple buttons to make the Group work on Keys? As of June 19th we will now be headquartered in Windermere, FL, just outside of Orlando. I would like to extend a request to all current and future customers, that if you are doing in event in the Orlando, reach out to me and let me know. I would love to meet you all face to face, I have been anxiously waiting to thank each of you personally, Now that we will be located in an area that I know just about all of you end up at one point or another there is no excuse.